We had an extra volunteer session on Sunday 28th June when Ben planted the remainder of our foxgloves at the north end of the west bund. 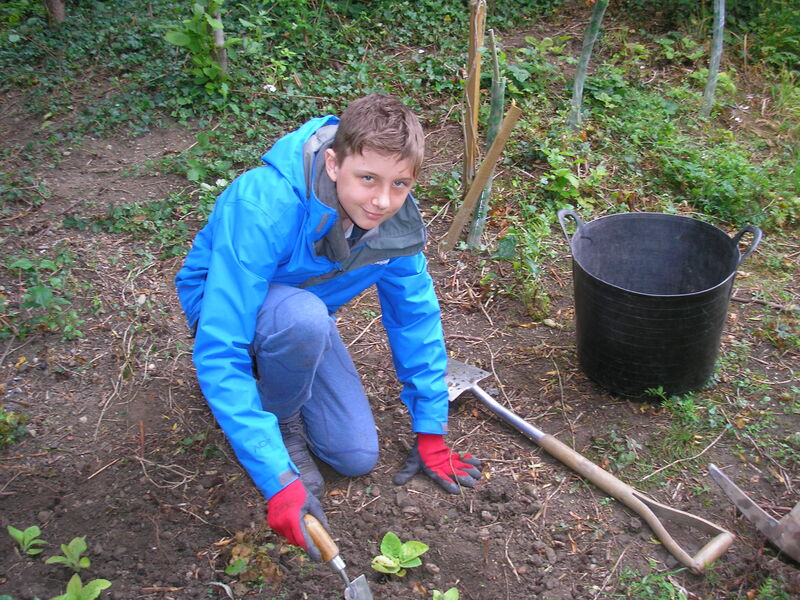 In spite of the heavy downpour on Saturday it was still necessary to use a pick to break up the bone dry soil. The plants were well watered after planting and again later in the evening. Slightly ironic that when we went out to water our newly transplanted foxgloves on Friday evening the heavens opened just as the first can was emptied. 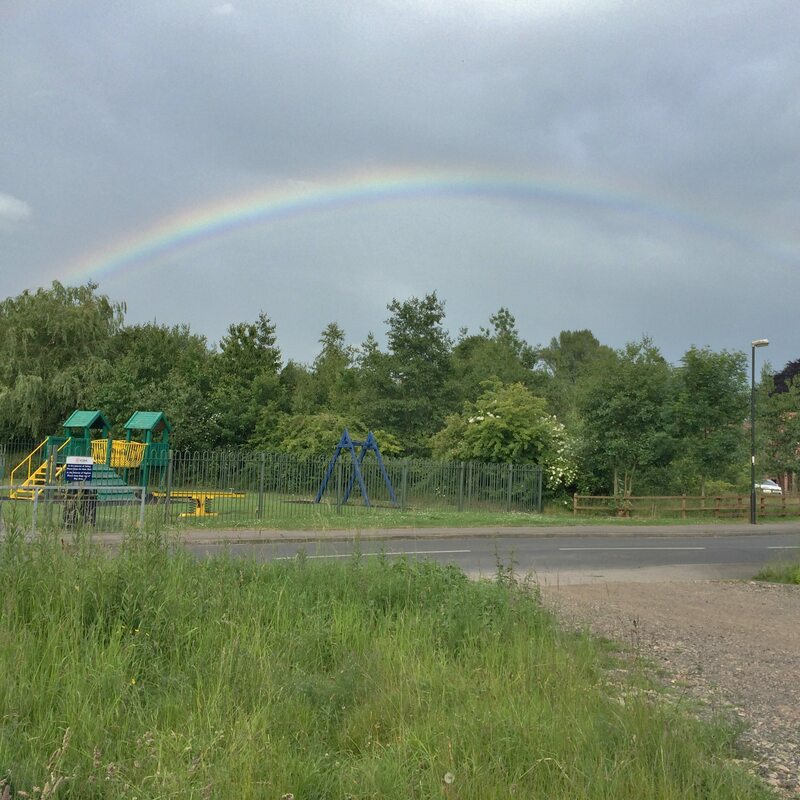 One consolation was that the MCT chair, Margaret Silcock, managed to catch the magic of a rainbow a few minutes later. Earlier on Friday Dave Moore and Malcolm were checking on trees and spotted a healthy young Rowan (left) and a group of small European Aspen (Populus tremula, right) on the site. 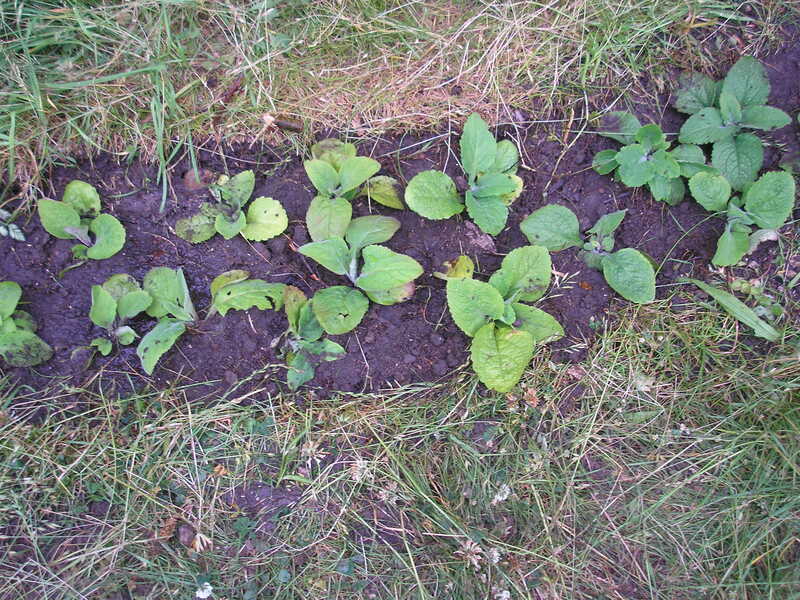 At our Thursday evening session on June 25th, 5 volunteers started to plant out the foxglove plug plants raised from seed planted last autumn by one of the team. The soil was extremely dry and hard, so that in areas to be planted had to be broken up using a pickaxe so grass could be removed. 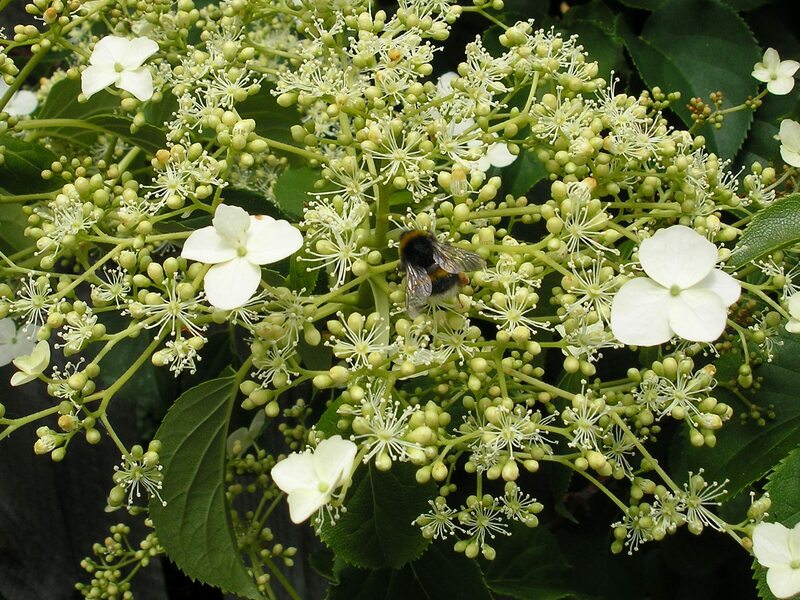 30 were planted to form 3 groups where the flowers should be clearly visible from the main path, and watered in thoroughly. 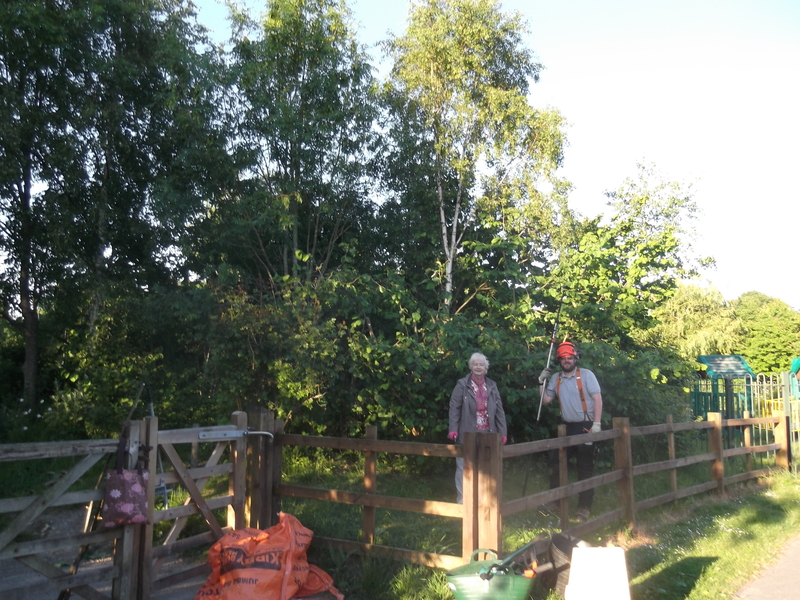 Our 6 volunteers on June 18th trimmed the grass around the pine, oaks and blackthorns planted last year to the east of the path and reduced the sideways extension of one of the overgrown crack willows, cutting up the trimmed material for composting. As you can see, Pam caught some of them on camera. 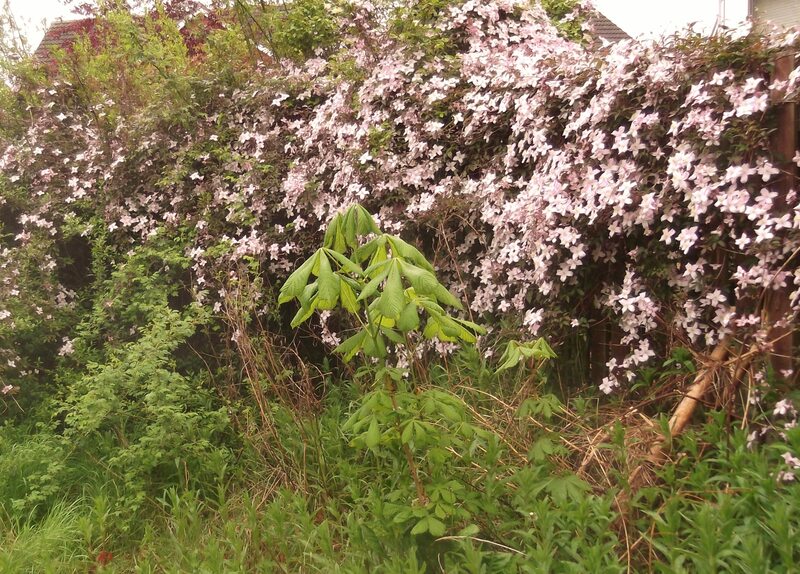 Nice to know it’s not just locals enjoying Mayfields plant life; Pam caught a very contented bee on camera today! 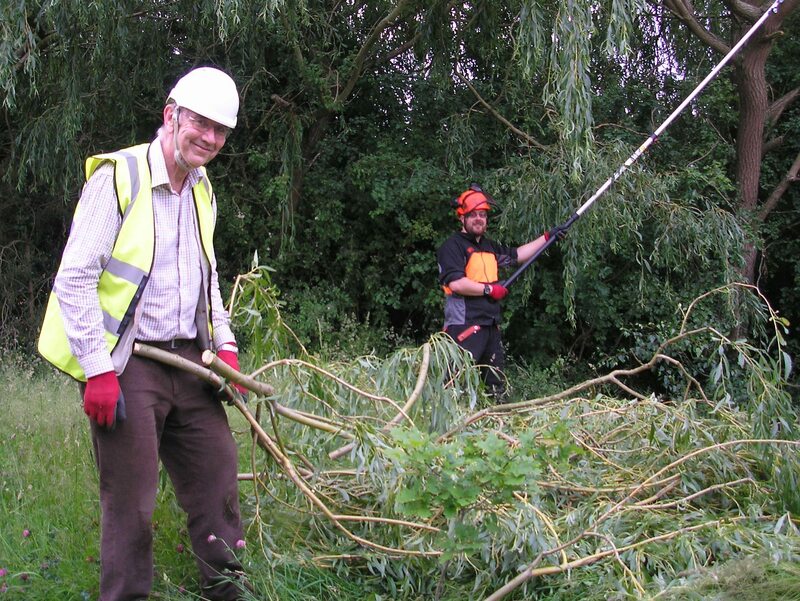 We were pleased to welcome Ben Kelsall to a MCT volunteers session on Sunday morning (June 14th 2015) to help our work on the N end of the west bund. 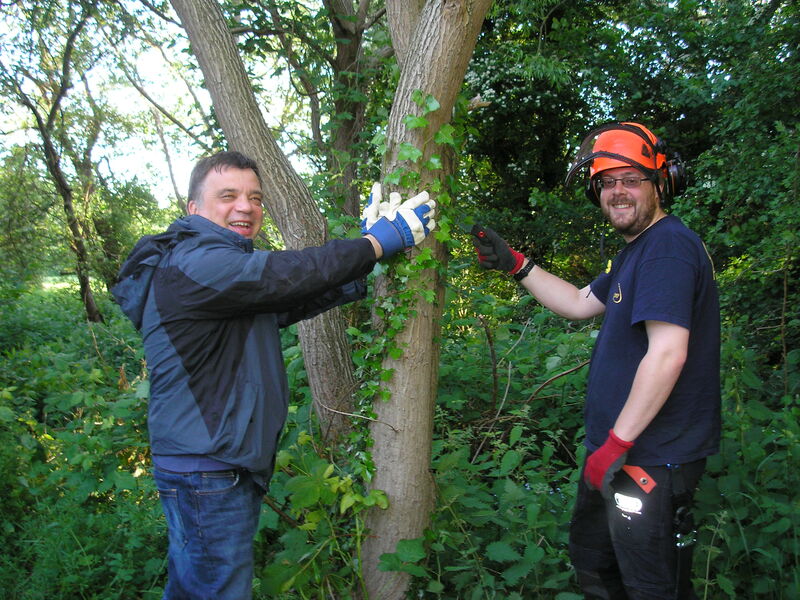 On Thursday 11th June, 5 MCT volunteers reduced the height of the hazels beside the Nelsons Lane gate (below). This was to improve growing conditions for (and view of!) the adjacent Silver Birch and Ash trees. The pruned material was were composted at the other end of the Mayfields site. 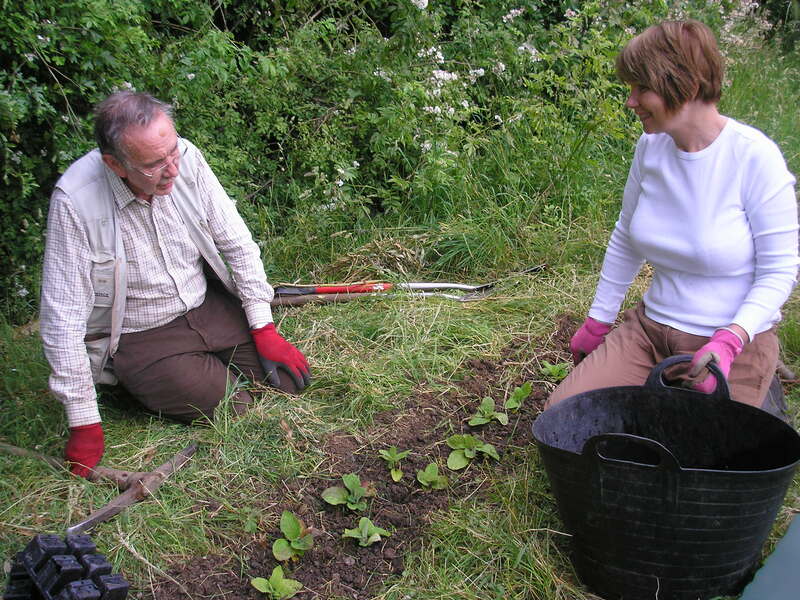 Although most of what you see of the work of MCT volunteers is what they do to woodland, the path and the meadow, they are also doing their best to encourage many forms of wildlife. 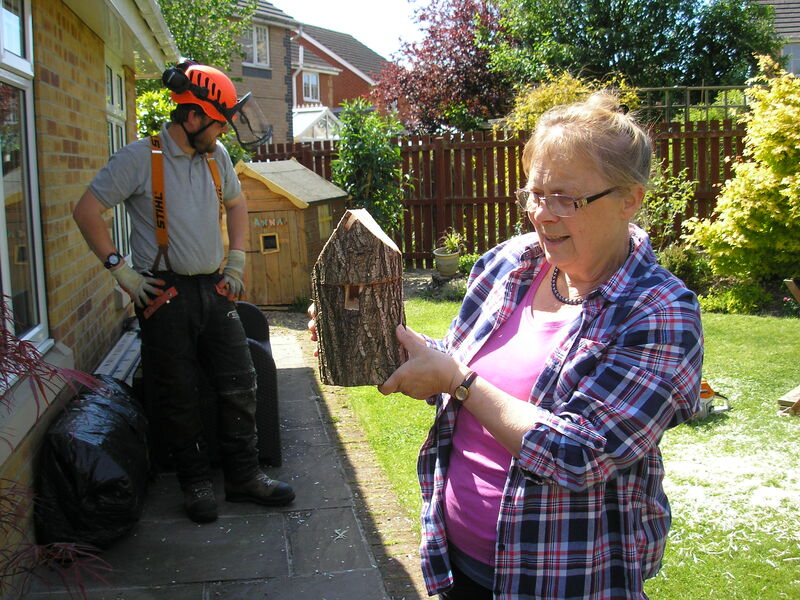 We now started making rustic bird nesting boxes from suitable waste timber from the site. 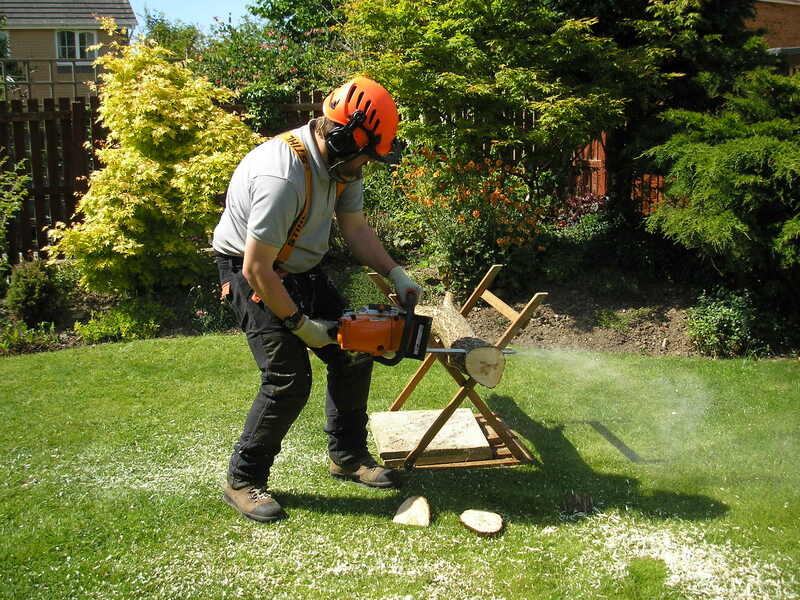 Pictures below show the sort of box Dave Moore is creating, working in an adjacent garden as we don’t use chain saws on the site. 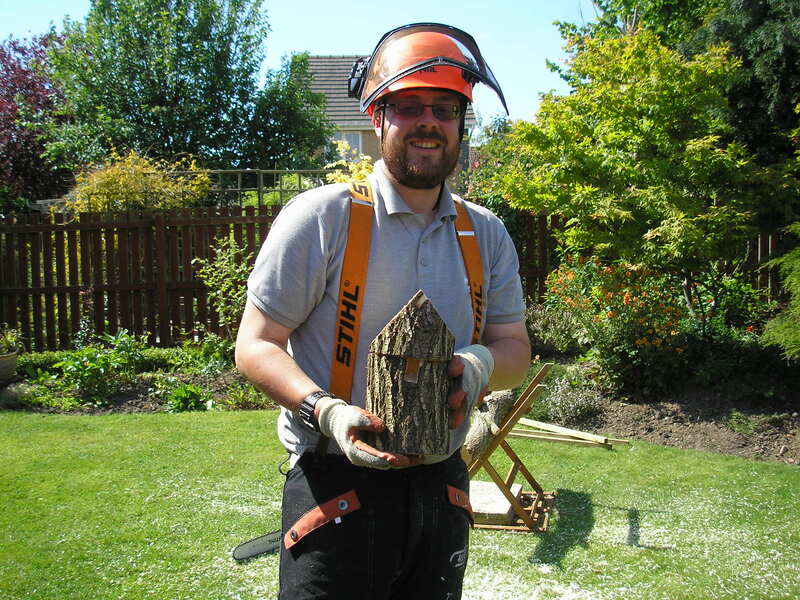 You can see the MCT secretary is impressed by his handiwork! 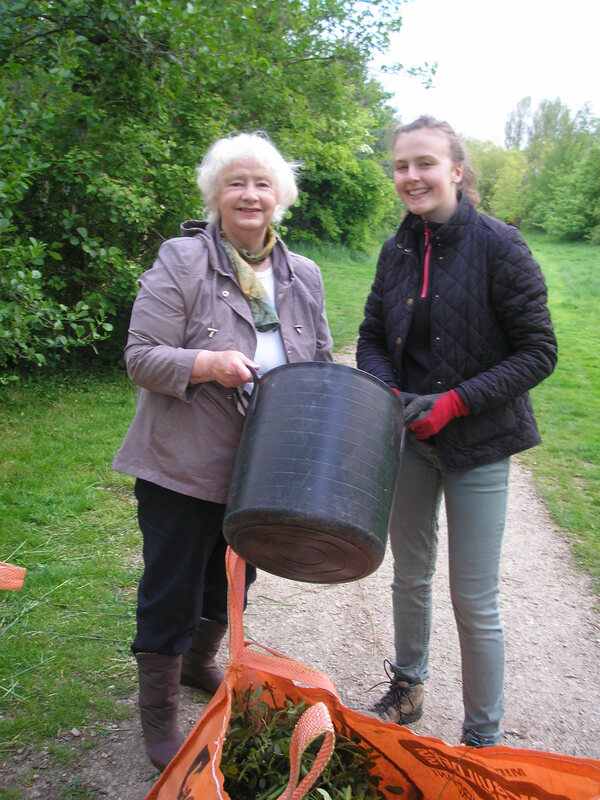 Our volunteers have spent several hundred hours over the past 2 years cutting back grass with mowers or selectively from overgrown tussocks with sheers and taking the grass away for composting. 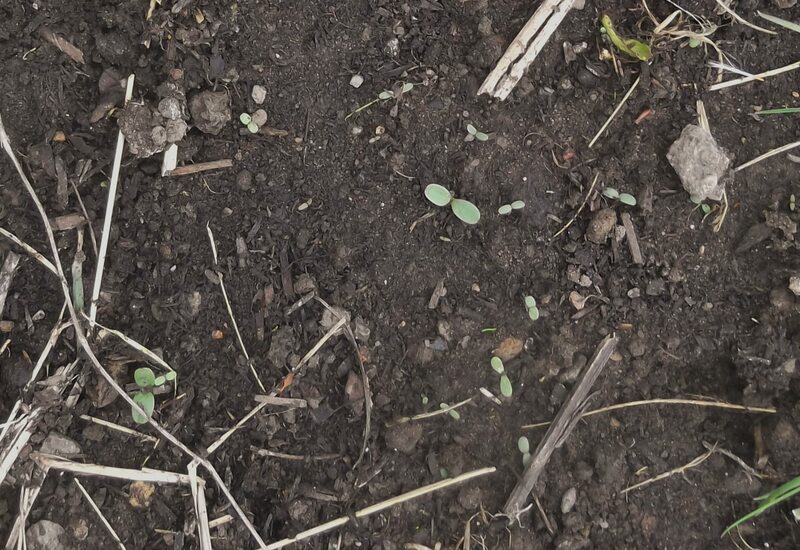 This has reduced the excessive nutrient nitrogen status of the soil which had risen due to pollution from the atmosphere and in rain over more than a decade. 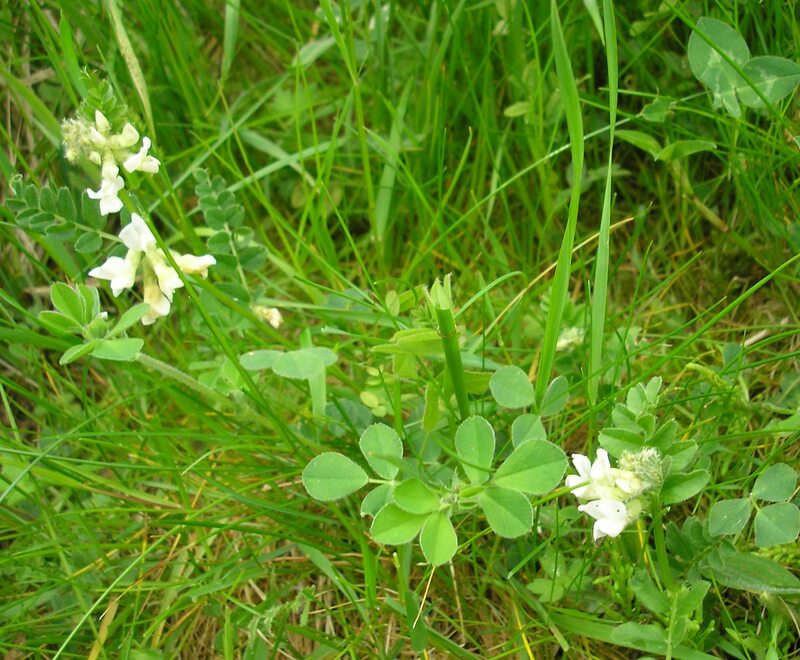 Lower soil fertility benefits wild flowers generally compared to grasses, especially legumes like clover that can fix nitrogen from the air via nodules on their roots. The red clover has become much more prolific as a result and is looking really beautiful at the start of June. 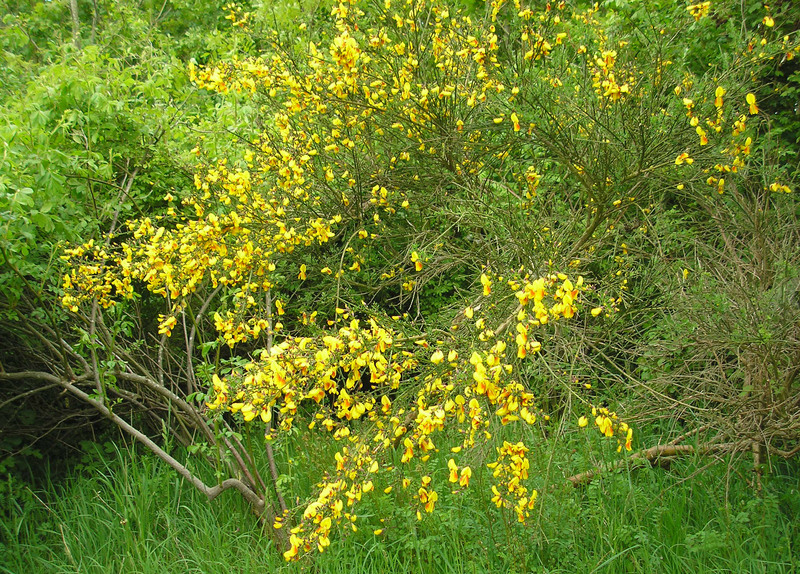 The closely related broom east of the path is also looking rather splendid now. 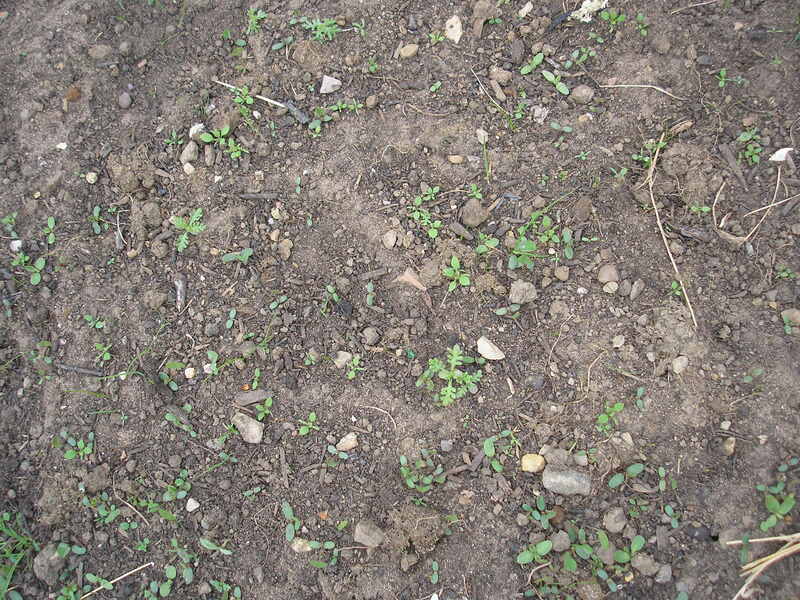 Our Kew “Grow Wild” seedlings are continuing to develop in the re-sown patches, as Pams photo taken on May 30th shows. 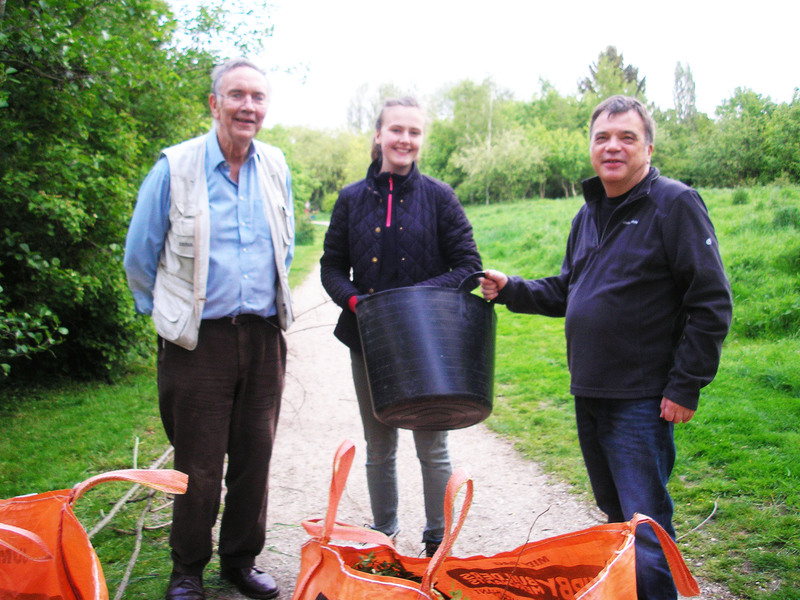 The final MCT volunteer session in May was on the evening on Thursday 28th May. The weather was good so Paul, Lesley, Harriet, Dave, Pam, Louise and Malcolm made excellent progress with improving the woodland and the N end of the W bund, building on the work Dave Moore and Malcolm had been doing earlier in the week to improve tree spacing, growth conditions and appearance. 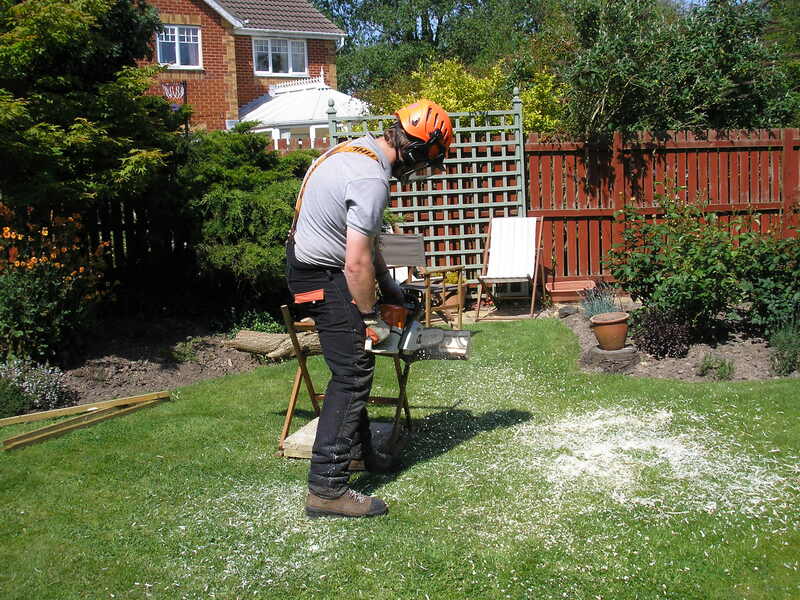 Care is taken first though to check for any signs of bird-nest building. One of the fun aspects of working as a volunteer on the Mayfields site is that you can never be sure what you will find among the diverse wild flower population. 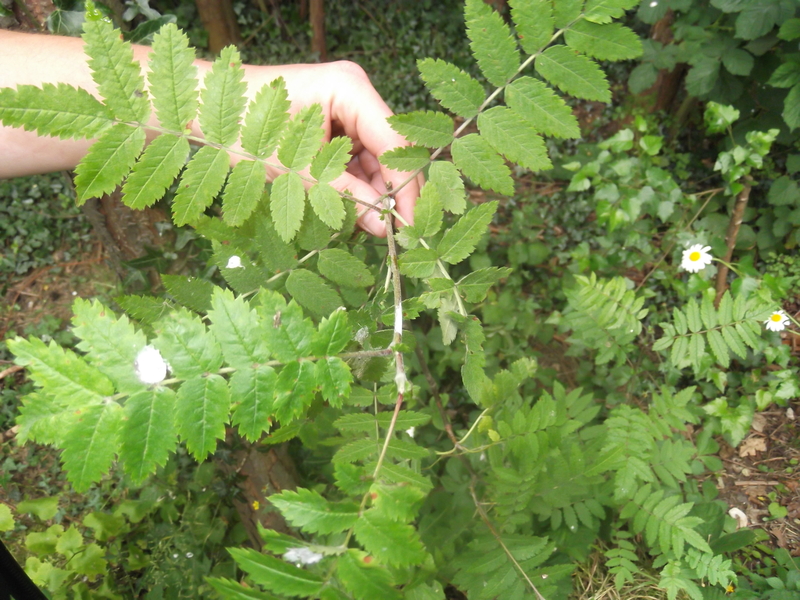 On May 24 we spotted a white vetch (below), probably a white variant of bush vetch, competing happily among the much more abundant purple vetches, and Pam caught it nicely on Camera the next day. 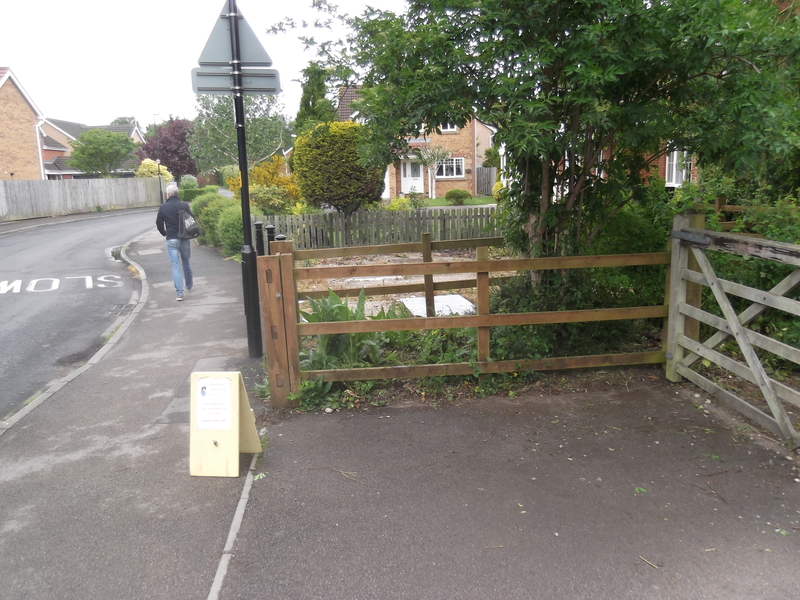 On Sunday 24th May Malcolm, Pam and Louise tidied area around the gate to make sure that the young Yew growing there would continue to have enough light, water and nutrients to thrive. They left a large clump of Teasels , but moved some further back from the gate area. 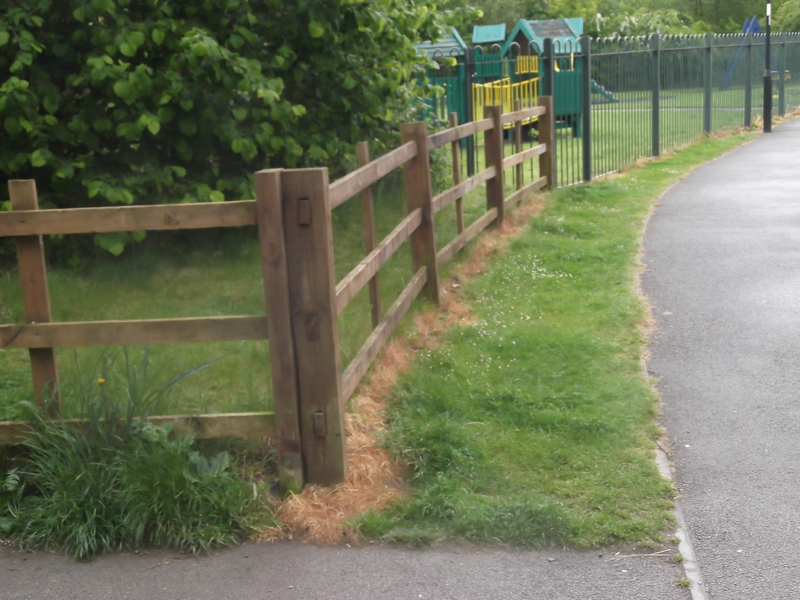 They also hand weeded the grass encroaching on the path to minimize mud build up. 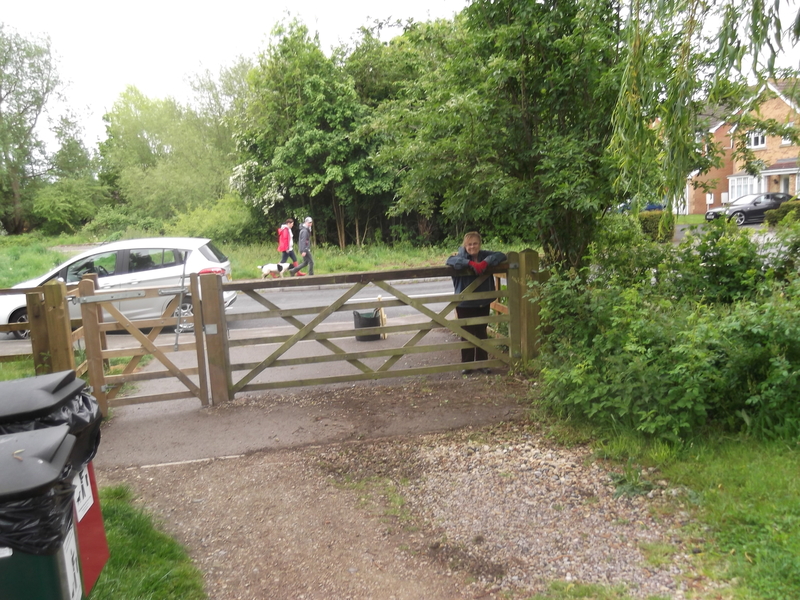 We were disappointed to see that CYC workmen had used weed killer under the fence although it was unnecessary as MCT volunteers regularly mow along the fence line and strim up to the posts where the mower can’t reach. We think that is worth the effort as it’s much more attractive and environmentally friendly. Unnecessary use of weed killer along fence line. Teasels are one of the many diverse wild flowers that may be found on the Mayfields site, mainly beside playground and near the gate. 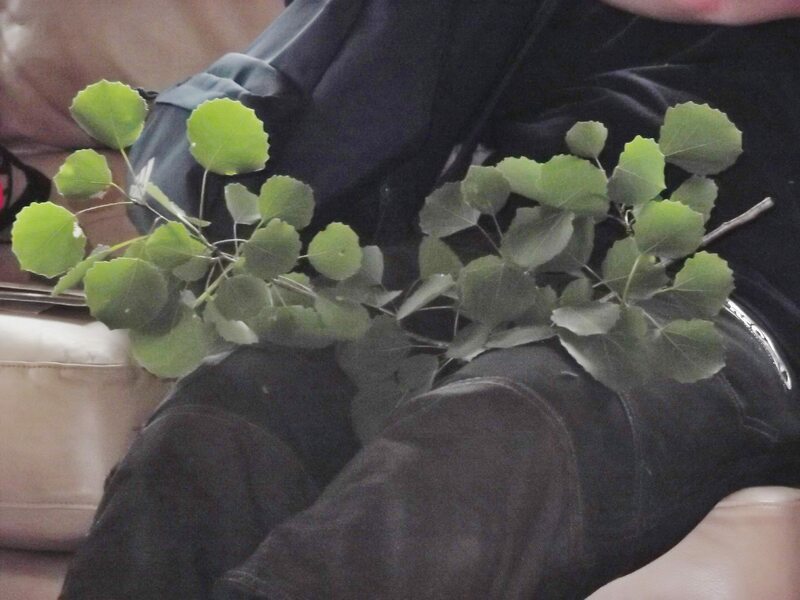 They trap rain water, as Pam’s photo below shows, and sometimes small insects; there has been much debate as to whether they are insectiverous. Back in 2011 Shaw and Shackleton showed (in an open-access paper published in PLOS 1) that there were no significant treatment effects on plant mass when they added dead dipteran larvae to leaf bases. 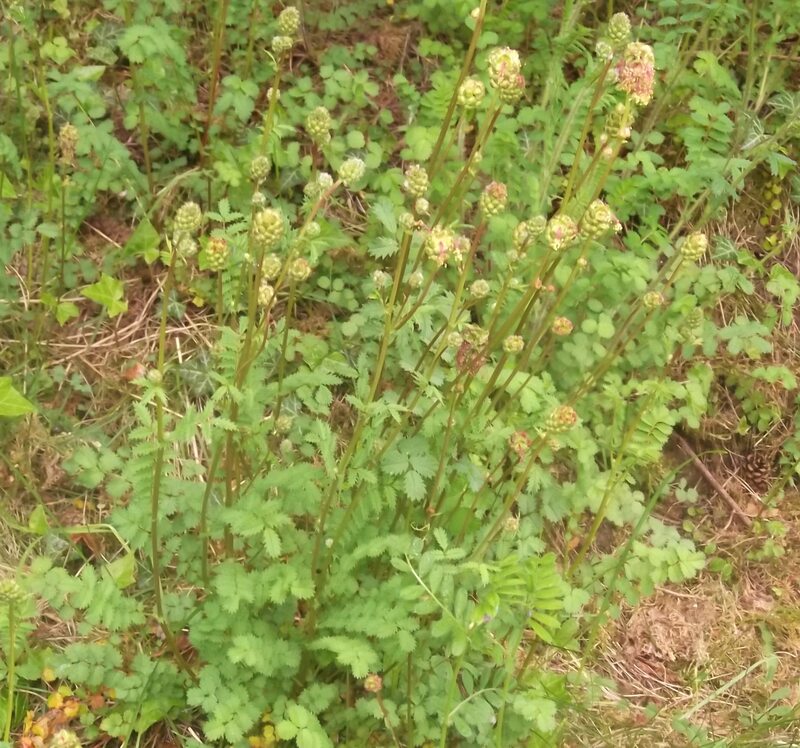 However, there was a 30% increase in seed production and in the the seed mass:plant mass ratio, giving a distinct possible reproductive advantage. 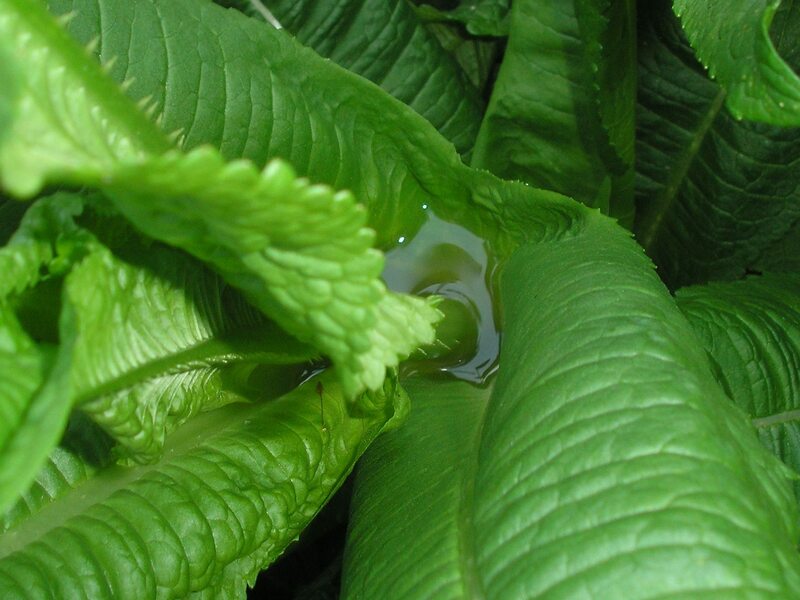 Water collection by Teasel leaves. 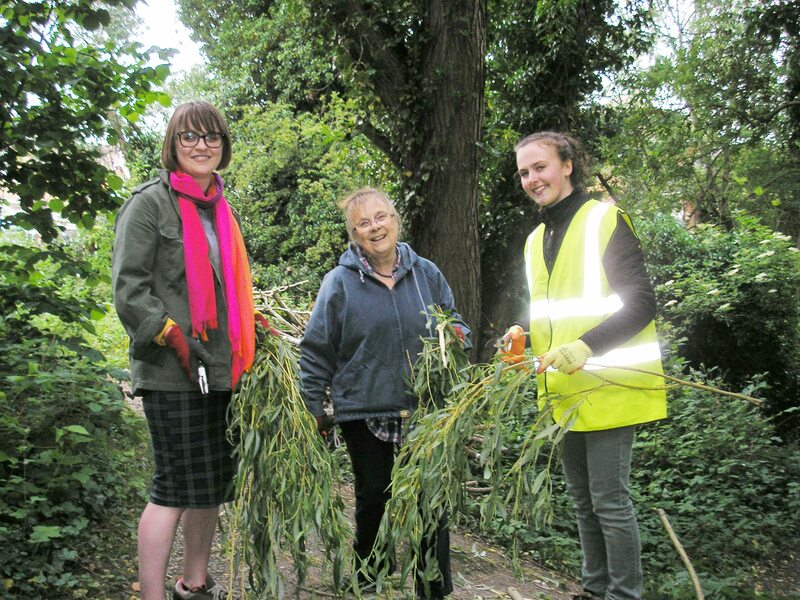 The warmish weather and occasional rain showers over preceding days meant that MCT volunteers, some of whom are shown in the photos below, were kept very busy improving the general appearance and growth conditions just North of Nelsons Lane at their Thursday evening volunteer session. For once we managed to catch Pam Brown, our photographer and a loyal management volunteer, on the lens side of her camera while working with Harriet Thompson. From the other side of her lens Pam took some shots showing progress of the Kew Grow Wild reseeded patches. We’ve included one below to see how good you are at wild flower seedling recognition. It’s starting to get a little bit more of a possibility 2 weeks further on than our earlier photograph!! Inspired about MCT aspirations after a week admiring wild flowers, and especially bluebell woods, in western Cornwall, a wander round the Mayfields site shows we still have a lot of scope for improvement. 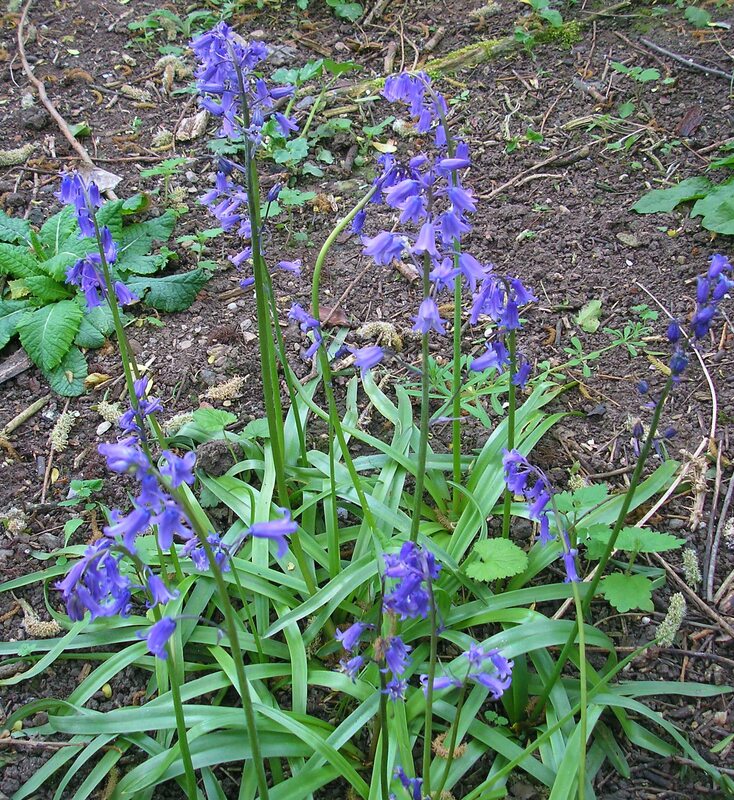 Mind Pam’s photo of a clump of the TCV English bluebells that MCT planted last Autumn shows our efforts were starting to pay off by May 22, 2015. 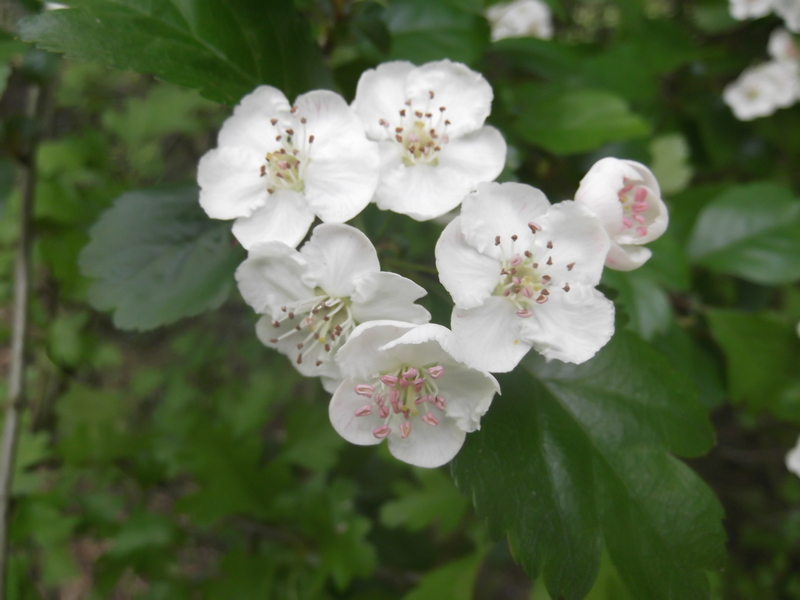 There are more wild flowers to see every day now in the 3rd week of May. The vetches and salad burnett particularly are starting to look good now, especially behind the W bund. At the back of the bund you can also see examples of where MCT has been pollarding crack willows in the interests of future management and longer-term safety. 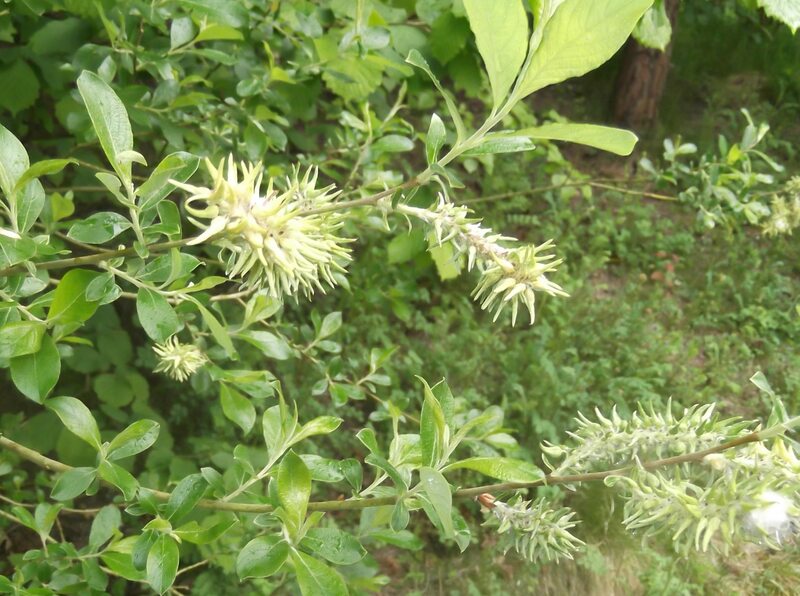 On other willows some attractive flowers may be seen in places. It’s inevitable that from time to time garden escapees will appear on the site. Where these are just poking through fences to search for the sun all we can do is stand back and admire, as for the beautiful clematis below. They are good for local wild life. Note though the young self-sown Chestnut tree. It will probably be retained somewhere on the site, but its present position is far from ideal for the adjacent resident in the longer term. To the casual observer the image below may not be the most exciting on our web site!! 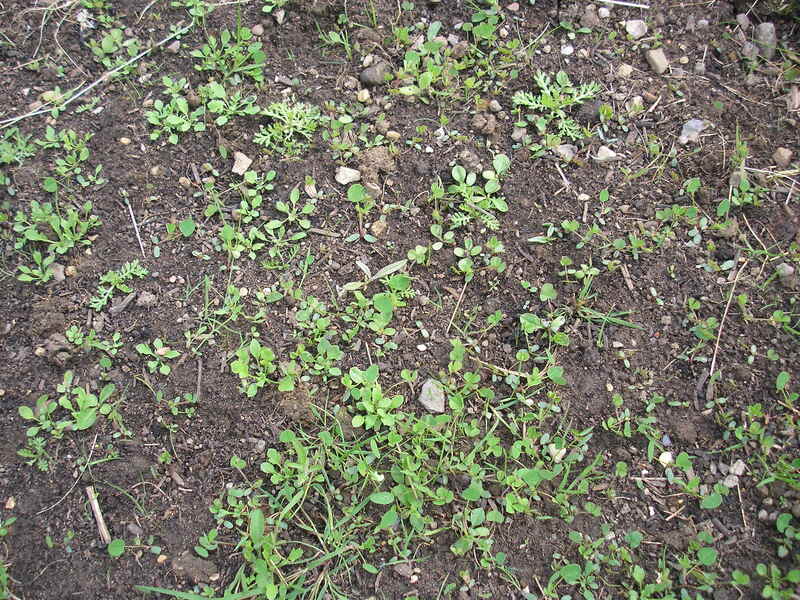 However it shows that, after 9 days of our careful daily watering regime, our Kew “Grow Wild” seeds are starting to germinate on the patches of soil added by MCT after grassy tussock removal. If not washed away by the monsoon that followed this bodes well for summer colour. As Spring marches on there starts to be a lot more to see at Mayfields. 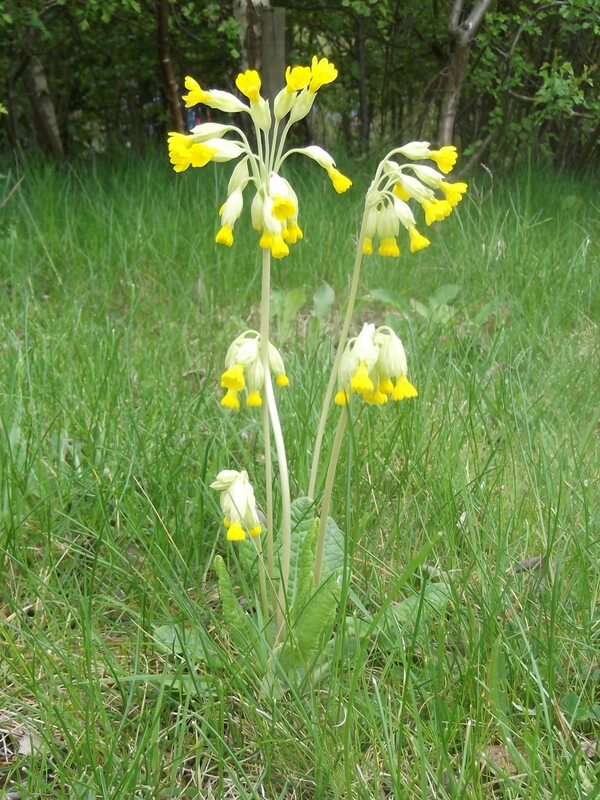 The cowslips at the south end of the meadow were particularly showy on May 1st. 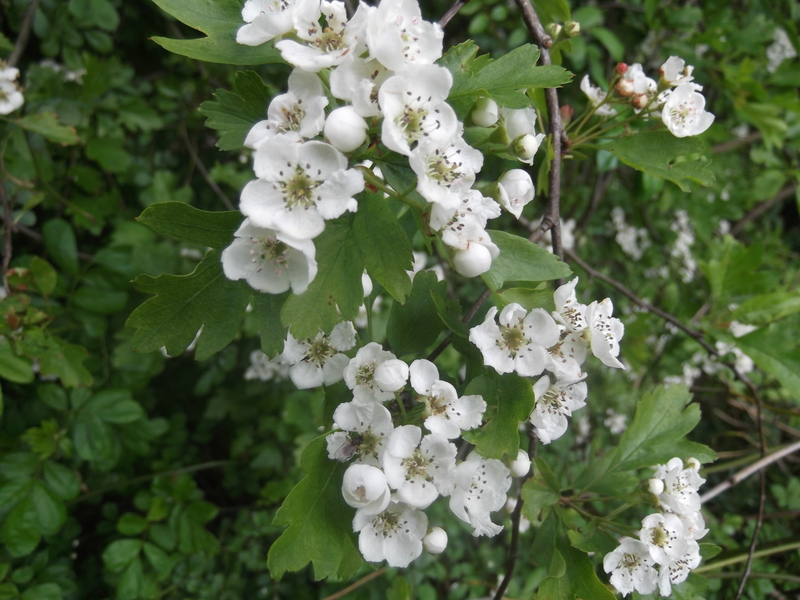 The blackthorns have turned from flower to leaf but two hawthorns were already blossoming on May 1st at the north end either side of the path. 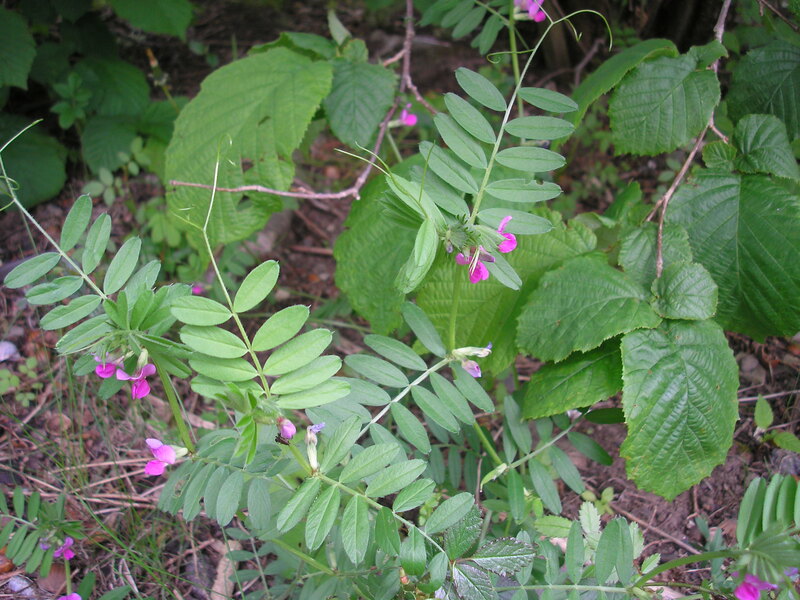 One in particular has a slightly modified leaf shape, suggesting genetic variation compared to the other – there are small flower differences too. Most are not yet flowering. 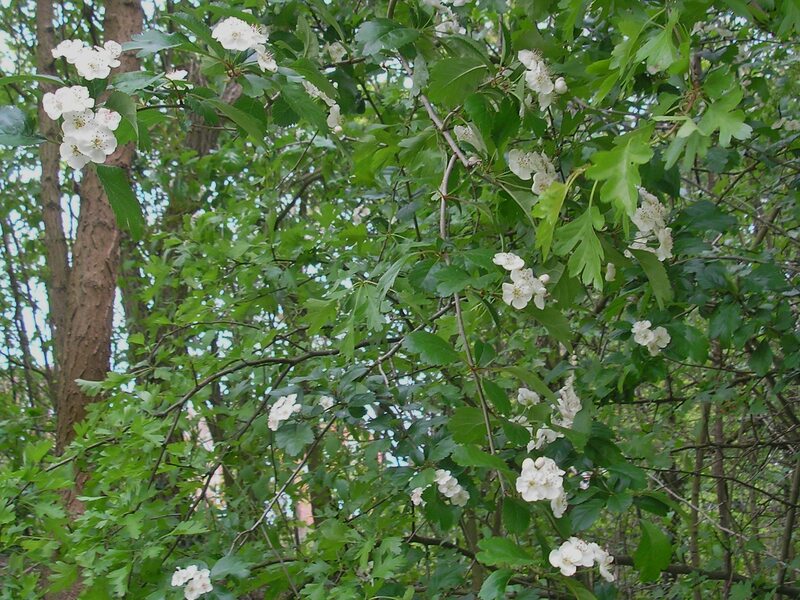 The smaller number of lobes on the foliage suggests that the one shown on the left below is either a midland hawthorn or a hybrid of midland and common hawthorn. 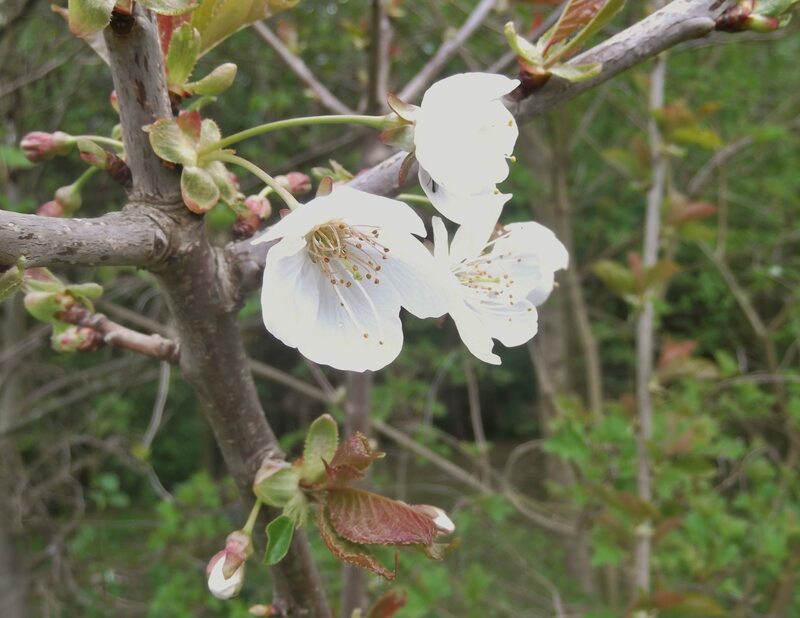 The cherries have almost finished flowering now, but you might catch some blossom at the N end of the west bund (as on the left below). 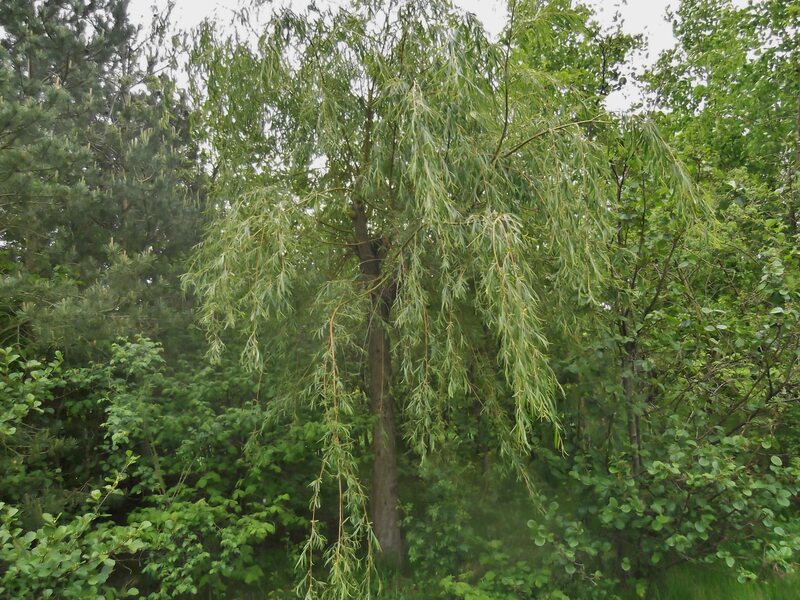 There are a few cherry tree saplings there that were hidden under the brambles that MCT has now trimmed back to safely pollard a crack willow; we suspect they are from cherry stones deposited by a passing human a few years back. Dave Moore and Malcolm spotted a young apple tree in flower on the W bund last Thursday, almost certainly from a pip in a discarded apple core. 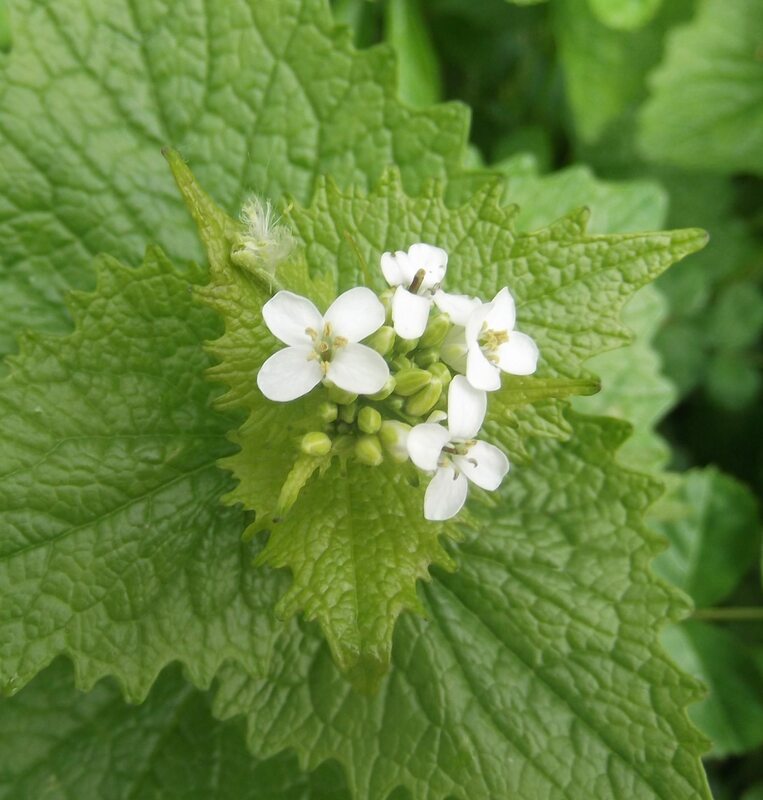 Apart from the bluebells and celandine that started to flower in April and are still flowering through early May, the Garlic Mustard (or Jack under the Hedge, above right) is looking attractive in patches beside the path.